You are a high school English teacher. Your show is about a high school English teacher using Hamlet to reach one of his students who lost a parent. How much of In Loco Parentis is drawn from your own experiences? A great deal, as you might imagine. A lot of Browning’s lessons, especially in the beginning of the play, are drawn from classes I’ve taught, though I like to think I’ve fictionalized Browning’s single-mindedness about Hamlet. He and I have definitely said some of the same things in teaching the play, but he also says some things I don’t quite embrace. I do explore the inevitable loss of parents in my classes, and the obvious extension from the loss of parents to our own mortality, because that’s a large part of what Hamlet is all about. Several times, I had students in class who had lost parents (and I didn’t always know that going in), and more than one of them found the line of discussion a bit hard to take. Those situations formed the core of the idea for In Loco Parentis. But the situation in the play is completely fictional. Hopefully, I was a bit more evidently compassionate than Browning. I was lucky enough to catch a production of your show last fall. Has the play changed much since then? Thanks for coming to see it. The spirit of the play hasn’t changed, but I’ve tried to soften Browning up a bit, since we found one of the critiques of the play was that he was a bit too severe, and audiences found it hard to embrace him. Hopefully Jonathan (Warman, director) and Desmond (Dutcher, actor) and I have addressed that in this production. There was also a need to make some of the growth of the characters a bit more explicit. The workshop production was really helpful in showing us where we needed to go to make this play as good as it can be. I’m indebted to The Manhattan Theatre Source for giving us the opportunity to work on it. As you mentioned, you have some of the same cast and crew from the fall. Given the short rehearsal time for Fringe, did you find that it gave you a little bit of an edge having pieces of the show in place, or did you basically start from scratch and come up with a completely new production? It was definitely comfortable having the same two leads, the same director and the same scenic designer, especially because summer made it hard to get everyone in the same room at the same time. I also think the process of creating these roles has to have been aided by the period of hibernation. Someone once told me that even when you’re not writing, you are, because you’re always exploring ideas, thinking about a script you are working on, percolating. I’m sure the same is true for the actors and director, who spent the whole winter having immersed themselves in this play, knowing there was a chance they might revisit it. Tell me a little about your cast and crew. How did you find them and what have they brought to the play? It’s impossible to tell you “a little” about that, but I’ll try. The first answer is professionalism. Sitting in your room writing a play is the ultimate act of optimism—you hope that a large group of people required to bring your idea to life will want to do so. And then you meet these artists who dedicate themselves to realizing your dream—it’s really amazing. Specifically, I think Desmond and Kristin (Katherine Shields, who plays Carly) have brought voices and directions to these two characters that have really deepened them beyond what I as one person with a specific viewpoint could imagine. Jonathan, whom I met when Emerging Artists asked me to select a director for a reading of the play last June, has also been irreplaceable, not only in seeing the play and in staging it, but also in helping me to believe the script was worth it. He really gets it in the way that I want it to be gotten, and that is very powerful. I have absolute confidence in his ideas for the play because I know he is as passionate and thoughtful as I am about it. There’s a lot more I could say—Maggie Pilat is our scenic designer, whom I met through a mutual friend, Yuriy Nayer is our Lighting Designer, Alison Carroll is our stage manager, and they have both worked with Jonathan before. Our two new cast members, whom we found through auditions, are Kareem M. Lucas and Marc Geller. Their roles are small but important, and they are both terrific actors. One thing you’re sure to see in this production is some wonderful acting. I understand you're a founding member of The Playwright's Group. How did that get started and was it helpful in the development of this play? I took the Gotham series of playwriting courses several years ago, and the last one was taught by Richard Caliban, who started this group after that class was over and asked me and other members of our class to join. His vision was of a weekly workshop in which playwrights could hear their work and receive feedback. It was looser than the Gotham course, and the people who came together to form the group were all very serious and very smart. 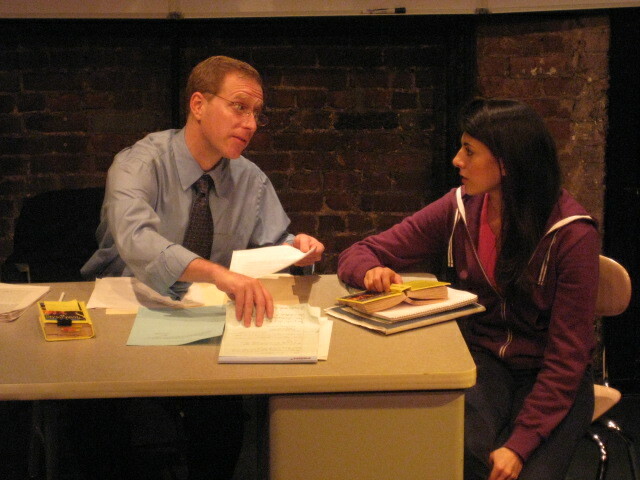 I had worked on In Loco Parentis in the Gotham course, and I did a reading of it for The Playwrights Group shortly after we started. That reading was crucial in helping me develop the play to the point where Emerging Artists noticed it. I got honest, insightful feedback from Richard and the other playwrights. I think without that reading, I wouldn’t be doing this play in The Fringe. What is next for you after Fringe? I have a production of another play, Pills, at The Black Ship Company in Chicago in April. And I’m just about finished with a new play—a holocaust drama called The Prediction set in Cuba in 1935. The play is basically about a father and son who have elected to leave Germany, and are trapped on a boat in the Port of Havana awaiting entry into Cuba, facing the option of being sent back or leaving the ship illegally. The problem is it’s 1935 and they don’t fully agree on whether or not it was a necessity to leave in the first place. The son believes it was, and that the Nazis will eventually try to annihilate the Jews; the father thinks that the Nazis are just a nightmare that Germany will awaken from. They basically argue politics and religion, like most fathers and sons do, but their arguments obviously have more weight given the context. It’s really an exploration of their relationship, though. It’s very pained, very laden with baggage. When the Fringe is over, I’m going to finish fine-tuning that script, and then start trying to get people interested in it. And finally, if you had a chance to meet Shakespeare, what would you talk about? Whatever he wanted. I imagine he’d be pretty interested in my experiences flying on airplanes and talking on telephones. And I’d like to think at some point I’d say, “Thanks.” Seriously, though, I suppose I’ve always wondered if he had any inkling of the effect he was going to have on literary history. I’m sure he knew he was a good playwright (assuming, of course, that he is wholly responsible for the work ascribed to him), but I wonder if he knew that in addition to writing dialogue that was riveting in the moment it’s delivered, if he had any thoughts about how rich and rewarding his poetry would be upon multiple re-readings. One great thing about being a high school teacher is that I read Hamlet and Macbeth every year, and they never get old, which is not true for a lot of other works of literature I have similar relationships with. I wouldn’t bother asking him how he did that, but I’m very curious what that does to someone’s ego. What’s it feel like to be the most successful dramatist who ever lived?